Don’t they look lovely and juicy? They’re just ordinary supermarket tomatoes, but roasted with balsamic vinegar, garlic and thyme they’re transformed. It takes 5 minutes to put together, half an hour in the oven and they’re done. Note: I’ve used thyme but oregano, marjoram or basil would also work well. Thyme – fresh if you have it, dried if not. Preheat the oven to 180C/350F. 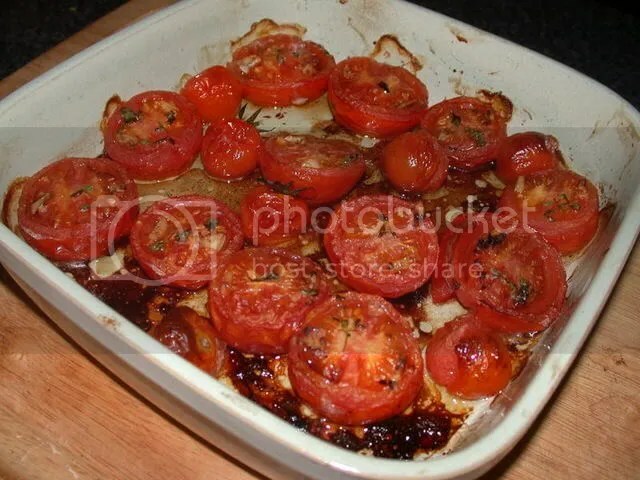 Cut the tomatoes in half horizontally (around the equator) and pop them in the roasting dish, cut side up. Slice the garlic thinly and push the slices into the tomato pulp. Splash over some balsamic vinegar and olive oil, shake the roasting tin so they’re all covered, and then sprinkle over the thyme and some salt and pepper, just enough to get a bit on each tomato half. Put it in the oven for about 30 minutes, keeping an eye on it to make sure it’s not browning too quickly. I served mine as a side-dish for home-made burgers and chips. Lovely. I love roasted tomatoes! Especially when you’re craving tomatoes during the off-season, taking the time to roast them can take bland tomatoes and concentrate their flavor to make them something tasty. One thing I used to do in my catering days was to take small cherry tomatoes and give them a long, slow roast (250F for about 4 hours) with olive oil, salt & pepper, thyme, and a few cloves of garlic. The great thing with these is that they’ll last several weeks in the fridge, so you can make some ahead for different dishes; some can go with a roasted vegetable pasta or risotto, some can go with a fish dish with some sauteed spinach… you get the idea. Yum! Now I know what I’ll do when my garden starts overflowing with these red beauties – thanks! Yummy —- it’s also VERY good with feta cheese & basil. Amazing, just made this to add to my lasagna. These look delicious. I’ll have to keep them in mind for when I’m next hosting dinner.